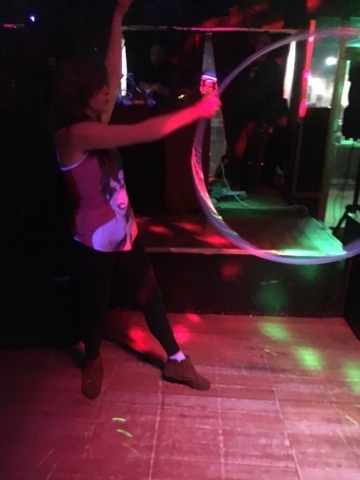 Last night was my first official gig performing with my hoop. A small bar about an hour south of here Smartycatz had a night where DJ Blackmamba opened (who I & her gogo dancer perform for), following Prophet Ecks of Wax Kings. 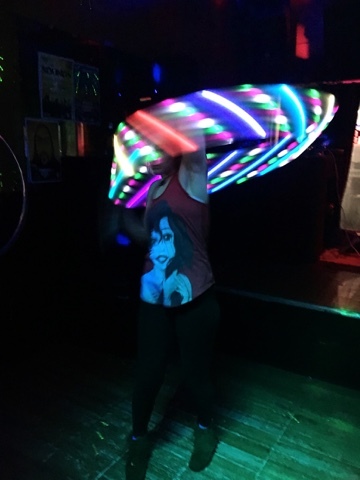 It was nice to just flow with my hoop and not need a choreographed routine. Blackmamba I met at my cousins party where I was dancing in the crowd. She's always been one to make the environment positive and always has a smile on her face. 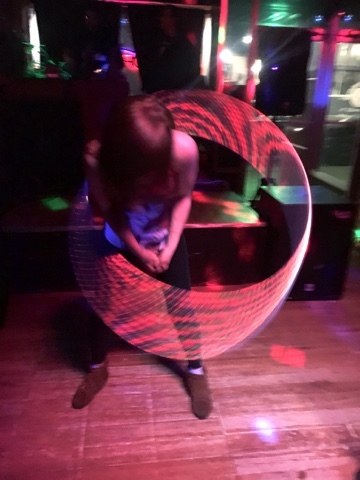 The bar supplied an LED hoop which happened to be a MoodHoop! 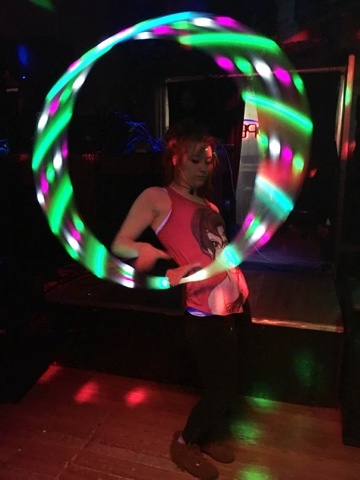 My LED MoodHoop is heavy weight so I can't use it much. I brought along a day MoodHoop and my beauty from The Hoop Smiths. Which took amazing pictures in the lighting! My man got upset and wouldn't come with me. He dropped me off pissed. Picked me up pissed. It hurt he didn't come to my first gig, but it was still an amazing enjoyable experience. 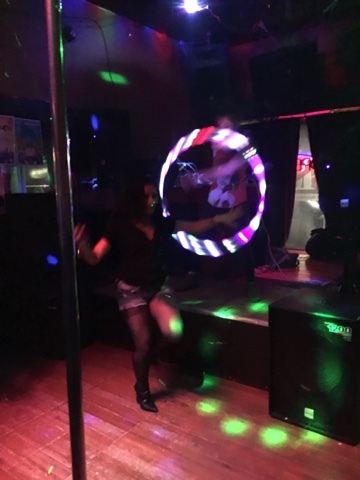 The gogo dancer is a vibrant young lady who specializes in belly dancing. I love this picture of my awkward stance while she danced. People were indeed amazed with my flow arts. Many wanted a picture with me! 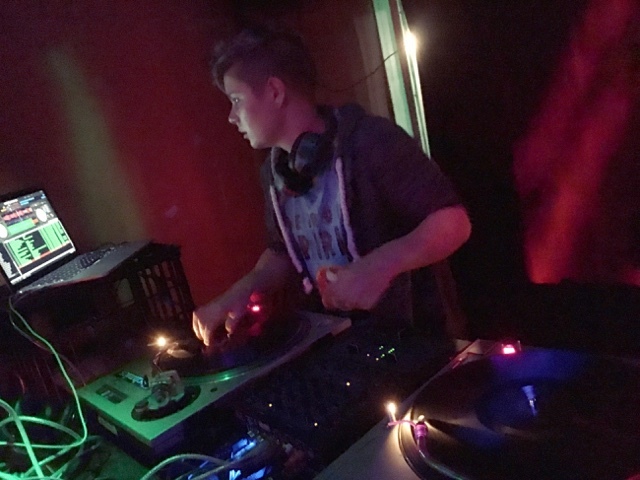 Some even "introduced" me to the DJ I performed for. Which was amusing considering each time she'd explain we are already acquainted. 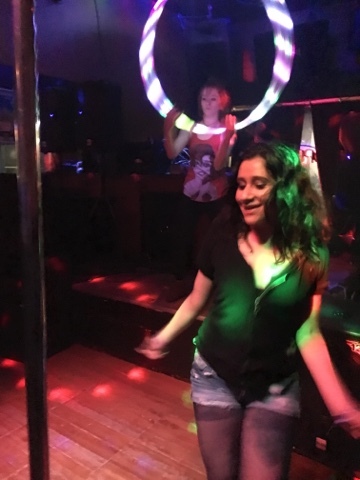 It was great performing in a bar fully clothed, using nothing but my hoop, and getting compliments on my dancing instead of my physical appearance. I've been wanting to start my performing arts portfolio quite sometime now. I've had opportunities this past summer to perform. Couldn't take advantage due to medical reasons. 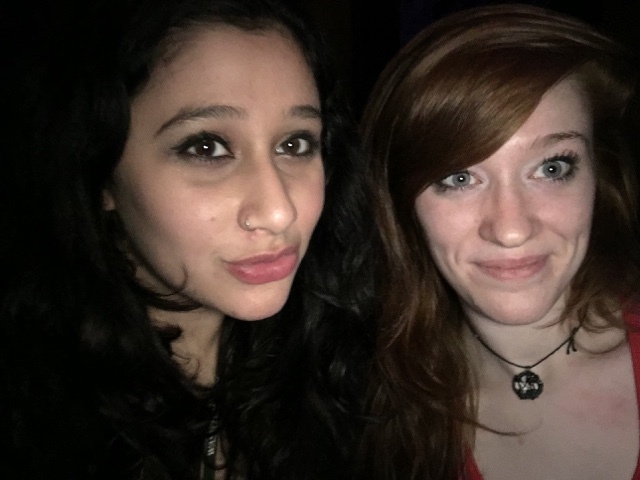 Last night was great, even if my significant other didn't come. Congrats! The pictures looked great and it was your so's loss not to see it. I guess it was his loss, but it's kinda mine too..
That's really cool. See, when someone says, "I'm a dancer," I expect something like this. Not a stripper. Take that title back, I say! Congratulations! You look so badass hahah. I'm sorry about your bf not going, though :( Is it just the old fashioned stigma behind it? I mean you're 100% clothed, you're a DANCER, not a stripper! Sorry, it's none of my business, I just felt bad >_< Hopefully he comes around. You do you! I love the comments about being a dancer, not stripper. Self respect goes a long way! He didn't like the area it was located...but I won't elaborate more on that.. I always do me, and you're right. He best come around! I was about to ask what made him mad but I can kinda take a wild guess esp if hes like the guys I've known in the past. And heck he'd get all mad if he wanted to. 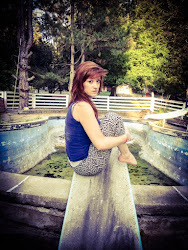 If i was in your shoes and I was doing me and he couldnt support me and be happy and what not and wanted to get pissy. then "Bye Felicia". He'd honestly get to stepping. Regardless of where it was and what not. As long as you were doing "YOU" and having fun and enjoyed it. That's all that matters. You haven't heard about this one, haha. But I agree on me doing me, it's the profession I chose! I was performing not partying, so he shouldn't be mad about that. Thanks for the support Lanes. You were here for me for years. But yet now we dont talk except thru here. That needs to change ma'am. and no i meant due to the guys I've known in the past. not the ones you've dated LOL. Speaking of which i could use some Harlynn advice. Message me. some how. even if you got to dm me on instagram :p I miss you girl. Omg that is awesome! You are incredibly talented lady! You make me miss my youth, haha. Back in the day, there were always cool performers like yourself in the bars in New Orleans and surrounding areas. My friends and I loved it! And by the way, anyone who doesn't support you, well......eff em. But you seem like a pretty strong woman who knows what she wants in life so I don't need to tell you that! Aww, thank you! I do my best to keep strong, like I did the other night. I used to be good at the hula hoop, you know for a awkward skinny middle school kid. I tried one recently, and it's always an epic fail. Obviously I blame the hoop and not myself. Haha when the hoop is lighter the more momentum you need for it to spin. For adults they make heavy weight hoops. Both exercise and fun purposes. Diameter matters too! 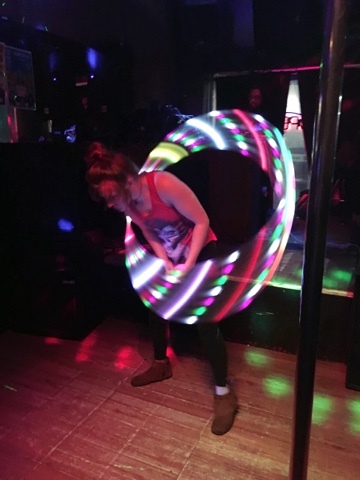 My hoops are all lightweight now that I can do multiple tricks. I once whacked my nose leg hooping, enough said haha. Too bad your man wasn't supportive. Ahh, sorry to hear about the fall out with your man, but glad you still enjoyed the gig!